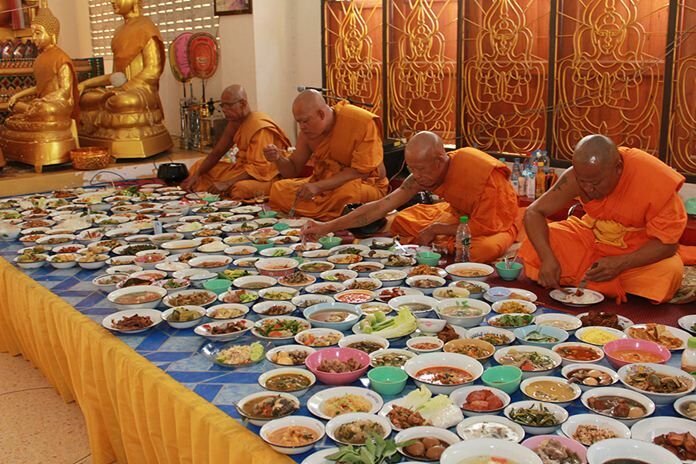 After the prayer sessions, monks partake in their daily meal offered by devout Buddhists. 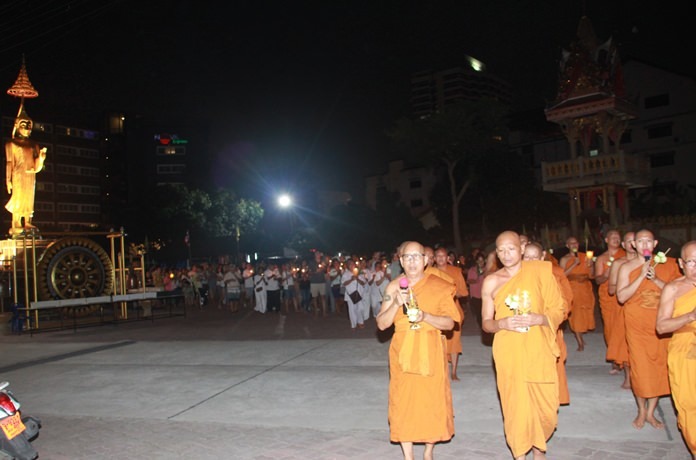 People congregated at temples and at the beaches as Pattaya observed Macha Bucha Day. Temples throughout the city saw worshippers present offerings of meat, dried foods and desserts to monks, light candles and incense, lay flowers at the feet of Lord Buddha and listen to sermons and meditate on one of the holiest Buddhist days of the year. Khao Saotong Thong used the holy day to collect donations for new facilities and offered special services for donors where everything from cash to bricks were accepted. 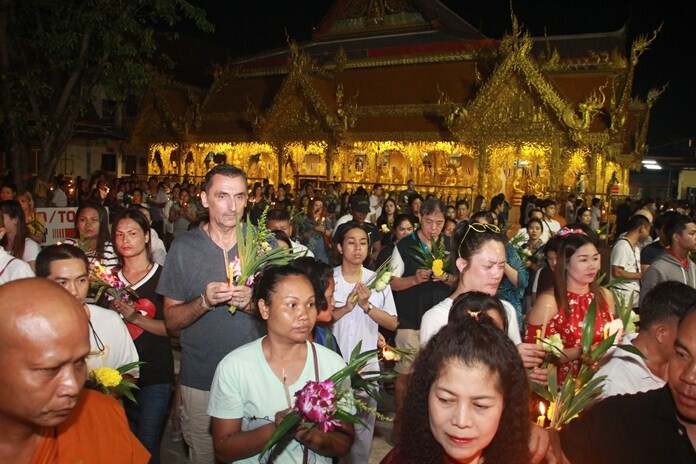 Ceremonies stretched into the evening across Pattaya as temples organized their “wien tien” candle processions. 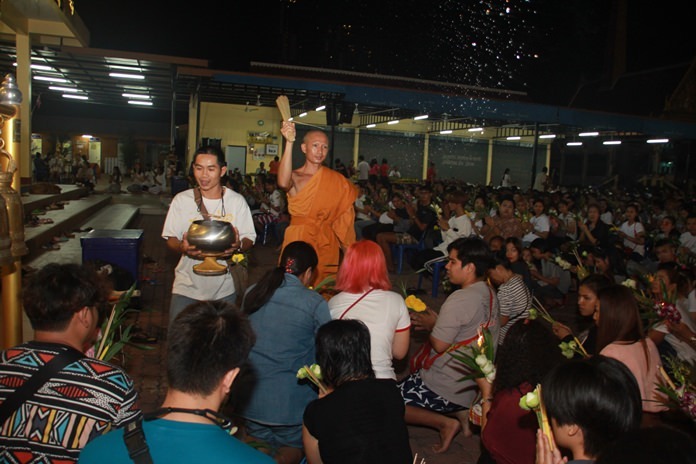 Nong Or Temple started their chanting service early to get the procession underway by 8 p.m. People made merit by offering necessary items to monks while those in East Pattaya did the same at Wat Khao Saotong Thong. 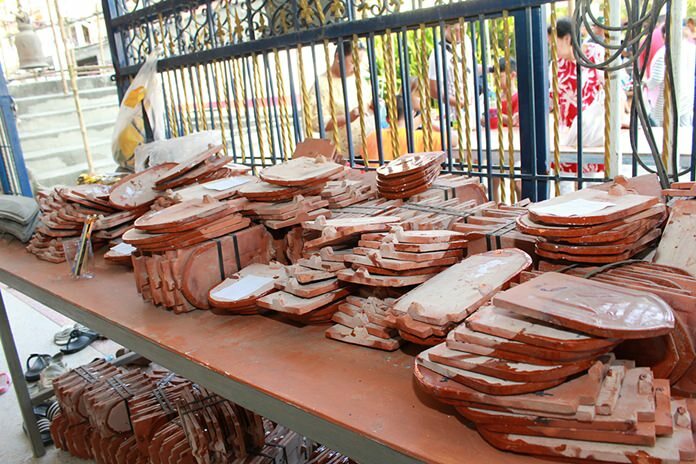 South Pattaya’s Chaimongkol Temple drew those from Jomtien Beach as well. 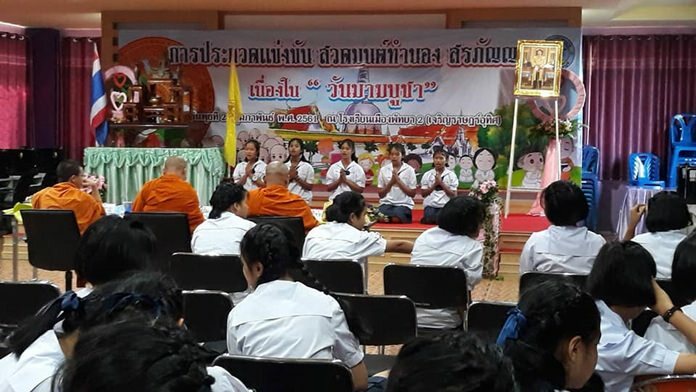 In the schools, students were taught the significance of Makha Bucha Day through dharma and history lessons with some schools bringing in local monks for chanting. Makha Bucha Day, considered Buddhist “All Saints Day,” commemorates the occasion when 1,250 disciples traveled to meet with Lord Buddha with no prearranged agreement at Weluwan Mahawiharn Temple in the area of Rachakhryha, India. 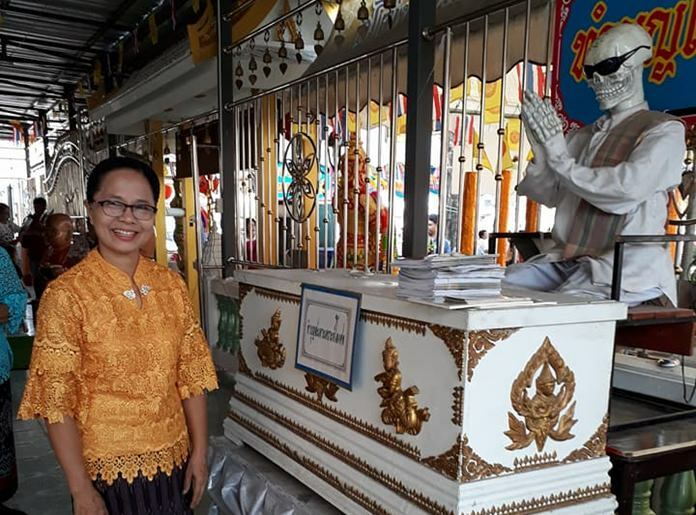 The day gained official recognition in Thailand during the reign of King Rama IV and became a nationally observed day with all government institutions closing down and observing the rituals associated with Buddhist commandments. As such, Thai owned shops and restaurants closed and anywhere selling alcohol also stopped for the day. Walking Street was dark until midnight March 1, when some bars turned back on the neon for tourists left with little to do for the evening. 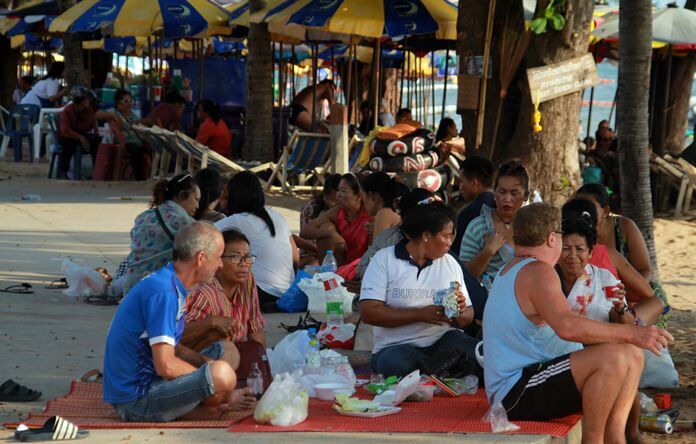 The daytime saw them, as well as throngs of Thais visiting from Bangkok and nearby provinces, hit the beach. All area shorelines were crowded with large groups congregating on mats covered in seafood and Thai delicacies. A monk delivers a sermon to devotees at Khao Saotong Thong. 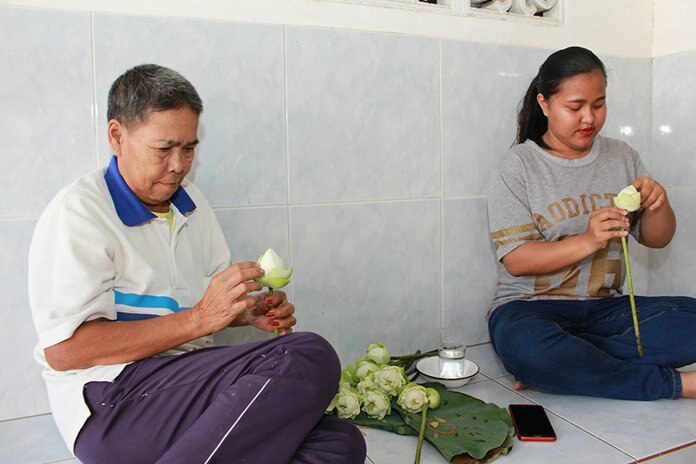 Women fold the petals of fresh lotus flowers used in rituals and prayers. 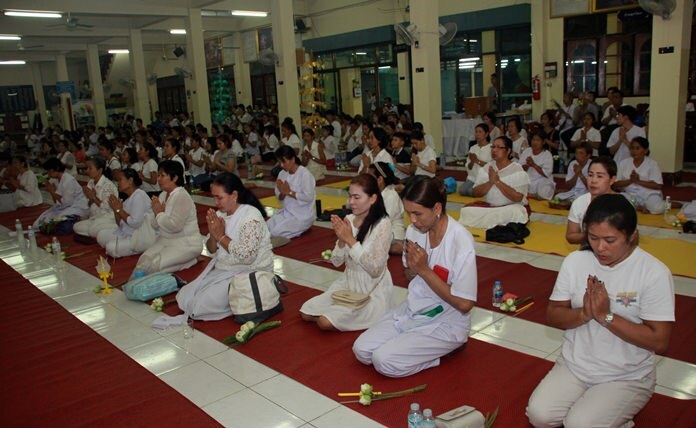 Pattaya School No.2 held prayer competitions for students to mark Makha Bucha Day. Devotees dressed in white signifying purity pray at a local temple. A monk blesses the congregation by sprinkling holy water over them. 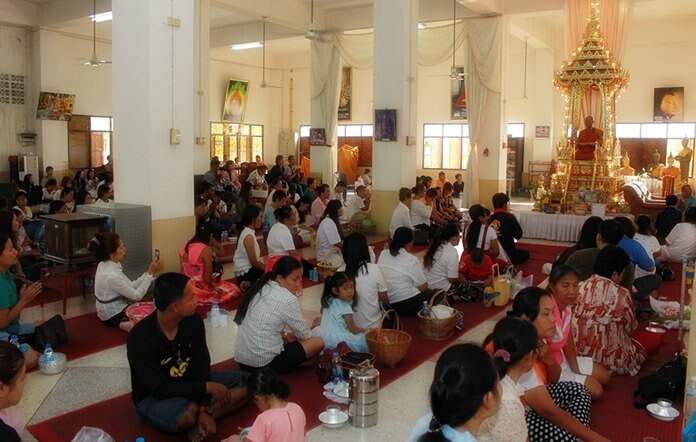 Thais and foreigners alike join to observe the religious holiday by joining in the Wien Tien activities at Wat Nong Or. Phra Maha Phuchit Thisaro, abbot of Wat Nong Or led the Wien Tien ceremony followed by thousands of monks and devotees. 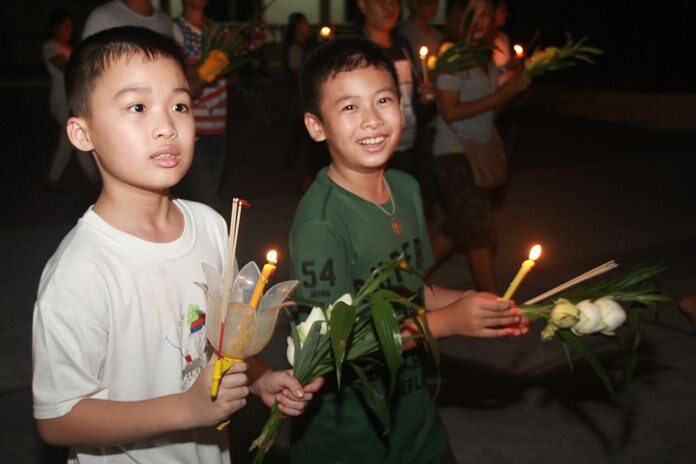 Young Thai boys enjoy themselves as they join the Wien Thien procession on Makha Bucha Day. 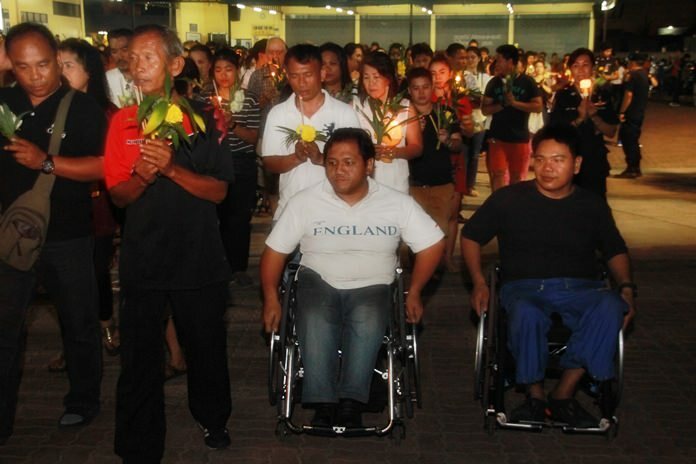 Wheelchair bound residents show their faith as well. One of the highest forms of merit making for a devout Buddhist is to donate money towards buying a coffin for the deceased without relatives. 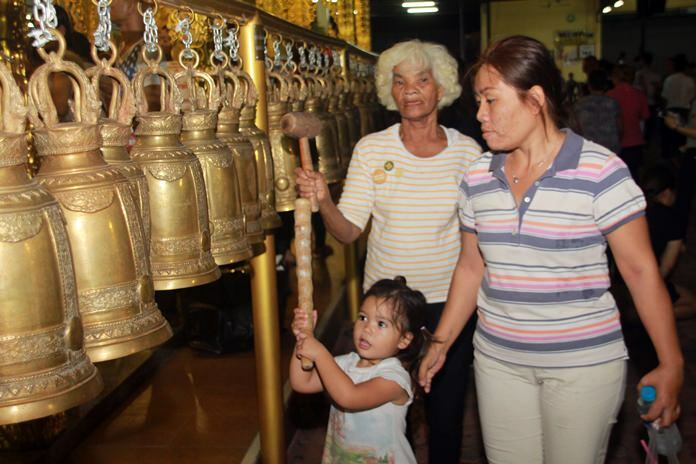 Another ritual is to ring the temple bells to cleanse the souls and drive away bad luck. 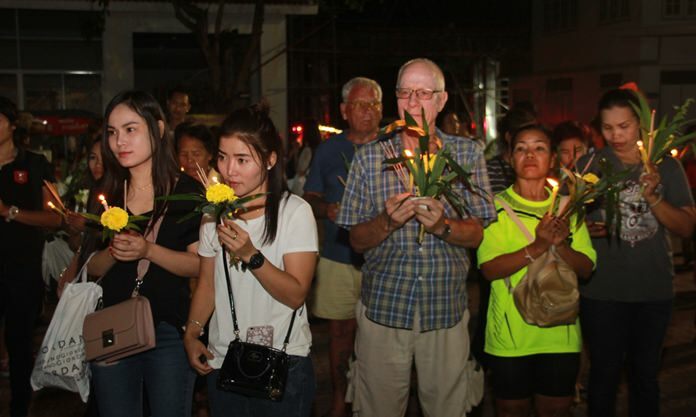 Thais and foreigners join in prayer at Pratamnak Hill. 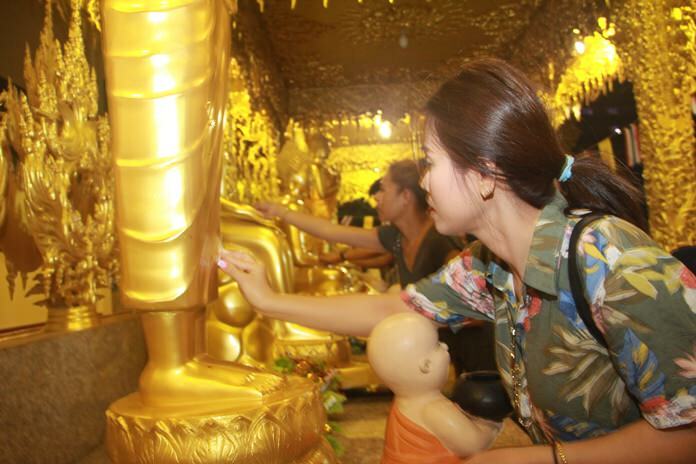 Families join in to paste gold leaf on Bhuddha images as a sign of devotion. 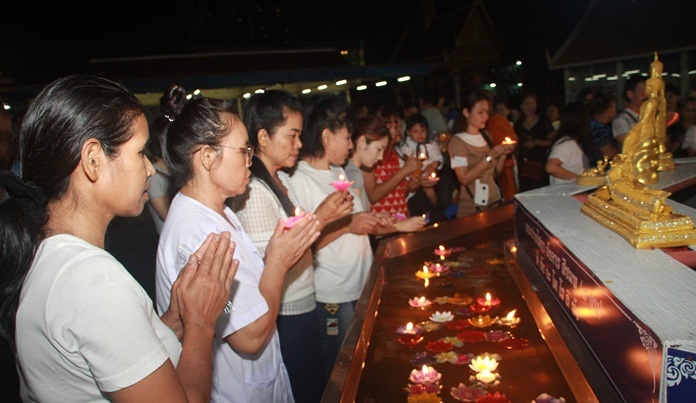 Residents purge their bad deeds and sinful behavior from the previous year by lighting little floats and placing them at the feet of Lord Buddha. 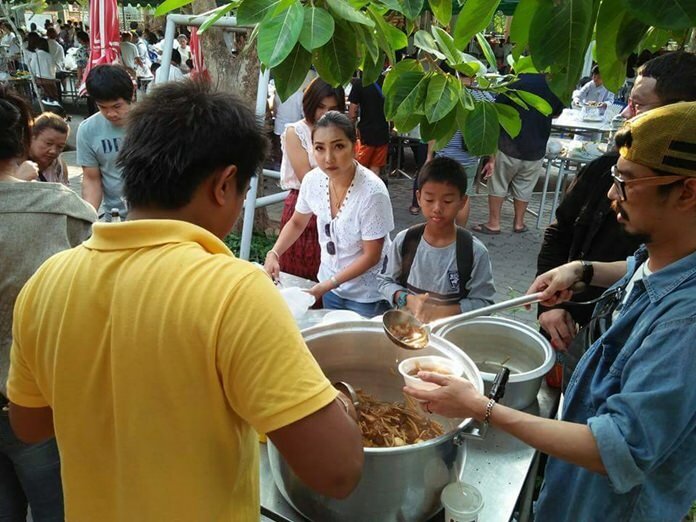 Throughout the day, many local businesses and residents join to provide food to others at the ‘Rong Taan’ or ‘alms canteen’. 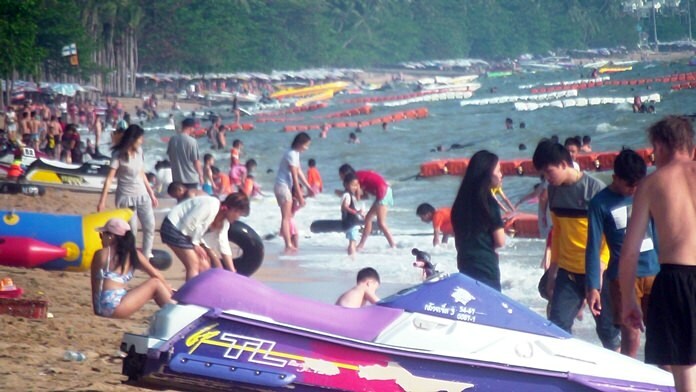 Since it was a public holiday; the beaches were packed with tourists and residents. 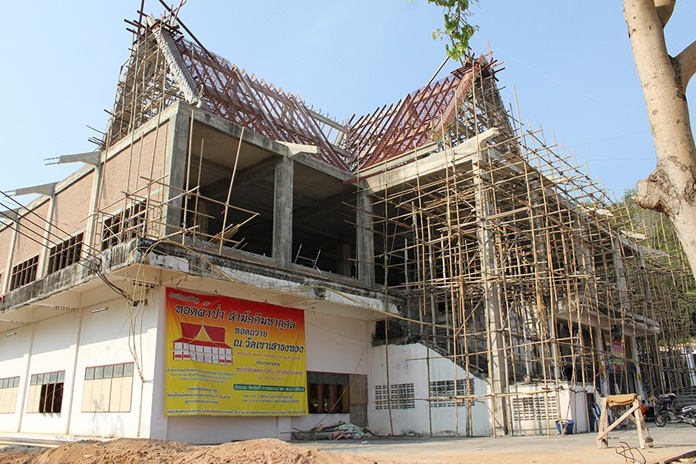 Wat Khao Saotong Thong accepted donations to help finish renovations of a new chapel. 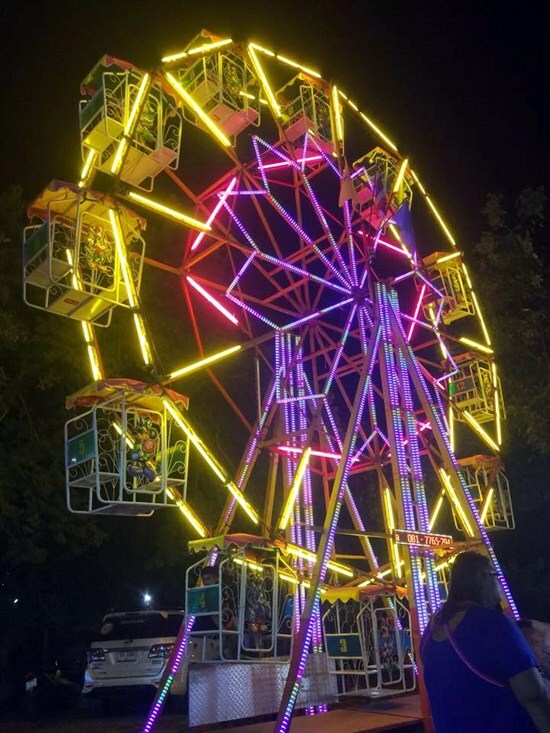 Holiday temple fairs bring the whole family together.